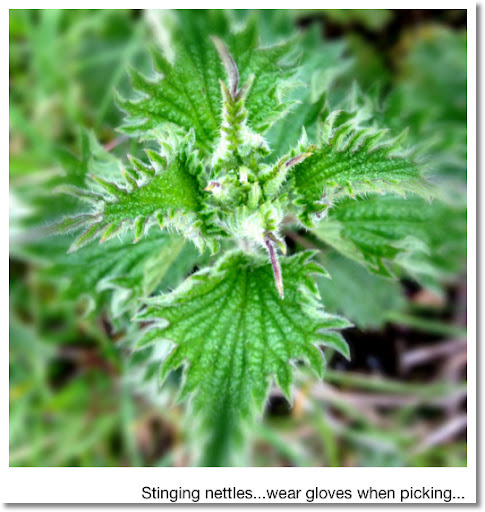 Over the years of spending time in Ireland, I've heard about nettles. But primarily about how they can take over one's garden. But recently I've also heard about embracing nettles and using them in cooking...foraging, I suppose. Although there are some delicious sounding soup recipes out there, I began looking for something a bit different. After some very quick searching (Internet access here in Ireland has not been easy for me! 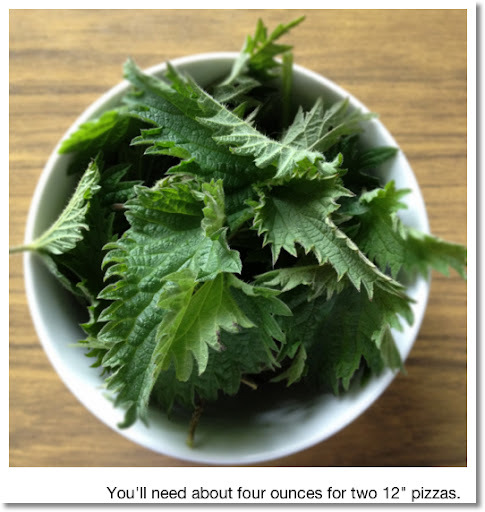 ), I happened upon a Food and Wine magazine recipe for pizza highlighting nettles with cream. So, we went out looking for nettles. It wasn't necessary to go far as they're lining the lane right outside the house. Given this was our first foray into the world of nettles, we decided to just spread the nettles over one half of the dough. The dough was made by hand. I used a Joy of Cooking recipe - it's easy to find a recipe on the net. 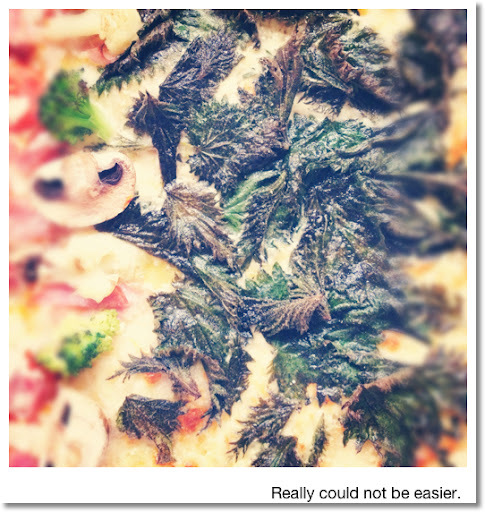 For the nettle pizza, you'll just make a white sauce from scallions, garlic and heavy cream. 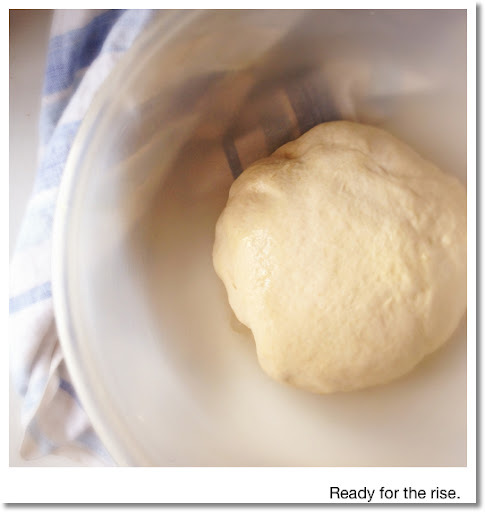 You'll reduce it and spread over the rolled dough. Then, you'll sprinkle some mozzarella on top and lastly add the nettles which you'll have tossed in olive oil. Easy. 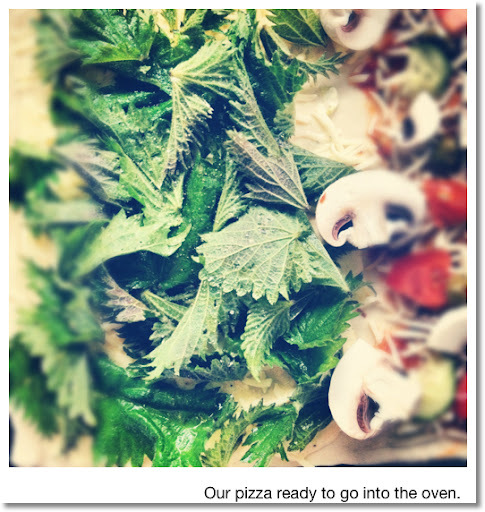 We had an unexpected but very welcome guest last night who brought us a carload of goodies from Marks & Spencer which we promptly snacked on...but she was also quite impressed with the humble nettle pizza. I think you will be, too. The nettles became crispy when cooked and tasted slightly like spinach to me. Although it wasn't called for in the recipe, I added a dash of nutmeg to the white sauce and think it lent a nice note.